How does Blizzard Make Maps? We wanted to take a moment to provide some insight into how Blizzard designs and creates maps. We expect this information to be helpful to anyone interested in map-making, or to those who would like to understand the various tasks that are a part of game development. The development team for StarCraft II is made up of a lot of different people who collaborate on everything we release. 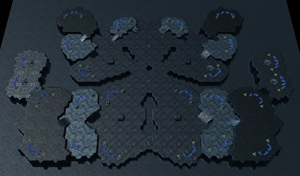 Creating maps is no exception, requiring both teamwork and coordination to get them into the game. Every map which Blizzard makes internally begins with a Level Designer. When this person starts on a new map, they begin from scratch, creating a map layout designed to hit specific gameplay goals. 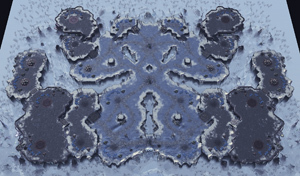 The Level Designer then gets help from other designers to playtest the map, and receives feedback on any problematic areas or concerns about the map’s balance. After these initial tests, the Level Designer then gradually expands to include additional groups for playtesting, eventually calling on our Quality Assurance department to give additional expert feedback. Beautiful may have been a strong word, so at this point, since the map’s design is pretty much finalized, we then hand over the map to our art team to do a pass. The art team will have a discussion on how to “art-ify” the map, and what directions we could go thematically. Ultimately, the art leads on the team are responsible for considering a lot of factors before they decide on the art direction for each map. It is their goal to be creative with each setting, while remaining consistent with the art direction of the rest of the StarCraft universe. It is also important that a map’s art never hinders the gameplay experience of the player. Once they’ve been given some general direction, an Artist will then do a pass on the map, feeling generally free to express their creativity. 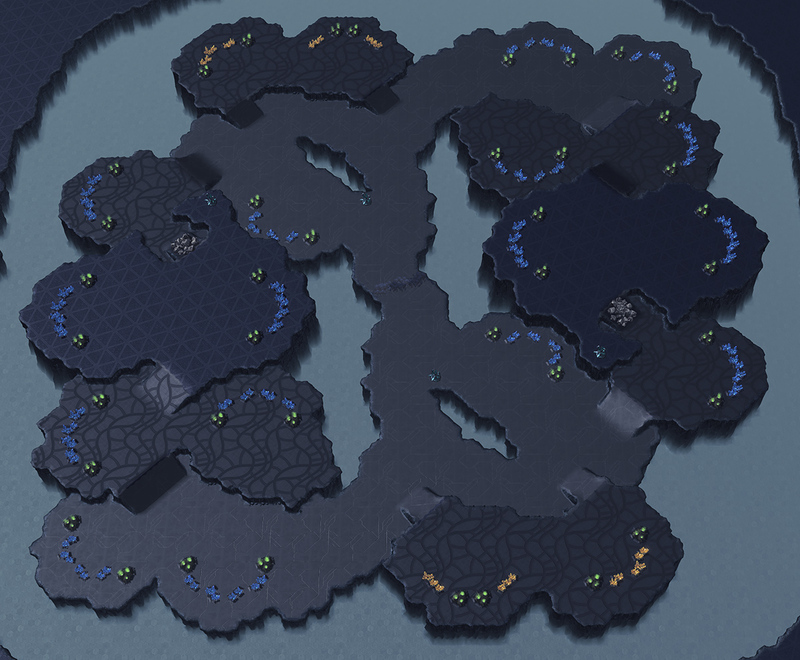 With each iteration on the map’s art, they’ll receive feedback from the art leads on anything they need to tweak to stay consistent with StarCraft themes, and may also receive feedback from the Level Designer on anything that needs to be tweaked for gameplay. Eventually, the map will be in a nearly completed state, and the map will be ready to ship. At this point however, we must do a performance pass. Through a variety of automated tests, we receive statistics on various performance metrics for the map, including heatmaps that will show any areas that are causing performance to fall below our standards. The map Artist then performs additional passes to remove complexity in areas that are having performance problems. This could mean tweaking lights, removing objects, or heavily simplifying the visual goal. This process inevitably leads to occasional disappointment as artistic vision is sacrificed for performance, but maintaining a high FPS is a top priority for any map that’s going to be used in ladder competition. How Does Blizzard Select Community Maps? When Blizzard selects a map from the community to use on the ladder, that choice is being made by a collaboration between our Multiplayer Designers and Level Designers. Similar to our internally designed maps, we evaluate community maps with one question primarily in mind: What layouts are hitting our gameplay design goals? In addition to this, we also factor in how popular a map is with the community, and how creative the map maker was with representing a theme, but these are secondary to purely evaluating the gameplay of the layout. Our most important goal is always to create engaging and varied gameplay in our ladder pool. This means we have to choose maps from a variety of categories of gameplay, while also avoiding any that allow for exploits or degenerative gameplay. We’ve seen a wide variety of maps submitted to the Team Liquid Map Contest over the years, and we love seeing all of the unique creative designs and artistic styles which the community has created. Whenever a popular map is close to meeting our goals, we look into whether small tweaks can bring it in line (if it isn’t already). Sometimes however, even a first place winner may be too far-gone to save, but we believe that’s okay. A map can be beautiful, and execute well on a design vision, even if that vision wasn’t meant for the competitive ladder. 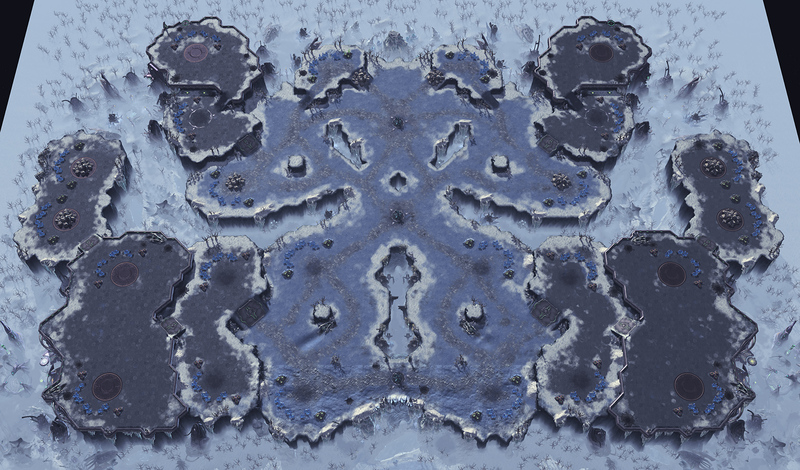 We hope that seeing our design process has given you some insight into how various experts all play a role in helping develop a StarCraft II map. We also hope that our emphasis on gameplay design resonates with the mapmaking community, as we believe that the gameplay experience is the most important thing for us to focus on making as great as it can be. We look forward to your comments and feedback in the section below.